Well, we just got to the Colorado location to shoot Across The Wide Missouri. Gable’s speedy gas-buggy is no worse for the wear, and he’s ready to start work. "Work" in this case involves a lot than just doing the movie ... 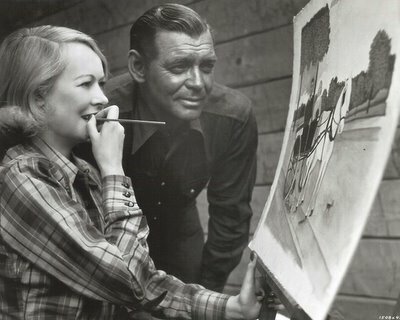 Seems Mrs. Gable decided it might be fun to tag along, so here she is to cast a little feminine ray of sunshine over those long, gloomy days in the remote wilderness. Lady Sylvia’s got their cabin all dolled up like home, and don’t worry about her --- she’ll pass the time with painting and crocheting while Clark pulls those long hours being heroic for the cameras. Everybody knows this marriage is headed for the shoals, but for the sake of the fan press, Mr. and Mrs. Gable are willing to make nice and pretend their wedded life is simply idyllic, just like every other couple in Hollywood. They say the camera never lies, however, and it looks as though our photographer has revealed a little more than the Gables, let alone MGM, intended. First, a little time off for fishing, and can’t you tell Clark’s just de-lighted to have the wife along. 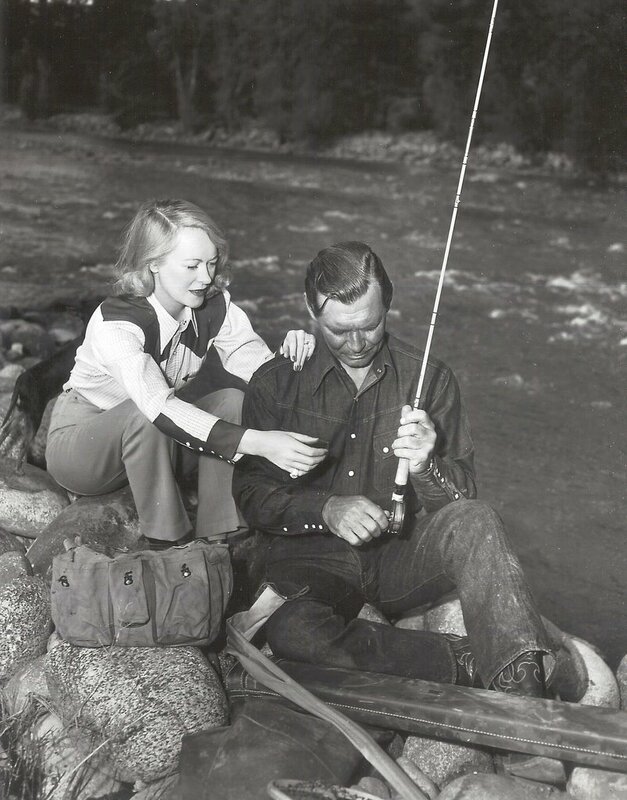 He’d be even happier if she’d leave his rod the hell alone. And isn’t she just too pristine in her outdoorsy outfit? Imagine her sawing the heads off fish they’re going to catch --- catch, that is, if she’ll stop doodling around with the man’s rod (time for that later, says Clark). 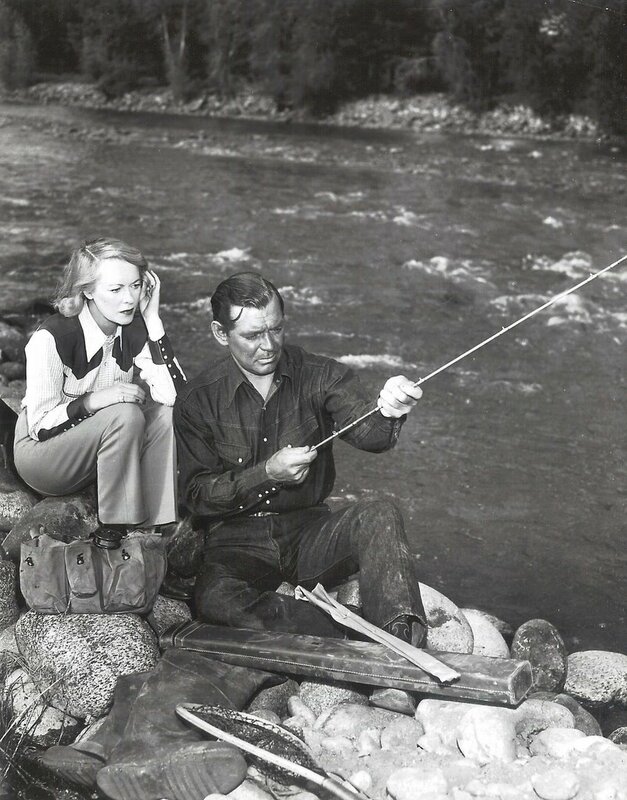 What if would-be fisherwoman Sylvia were to go headfirst into that mighty river, just like Bill Powell did in that rib tickling Libelled Lady sequence? Bet the fan mags would have a blast with a shot of that, even if they were barred from the Metro lot for life as a result. This angling expedition won’t last much longer. Lady Sylvia broke a nail and had to be rushed to the infirmary. Here are the Gables checking out some of Sylvia’s artistic handiwork. Wonder where that canvas hangs today. We like to speculate on little things like that. Clark’s probably speculating on how long it will take to get his stuff packed once they get back to the ranch. Howard Strickling and the guys in publicity asked him to make it look good at least for the location gig. After that, all bets are off. But can Gable hold his temper even for that long? …. Okay, here’s where things gets dicey. 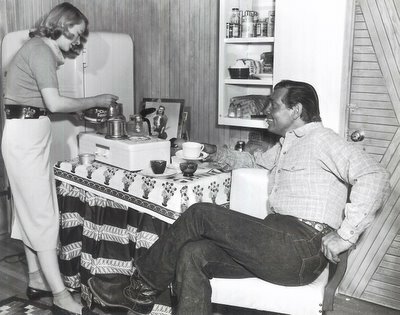 It’s breakfast time, and the Gables are having a nice cup of coffee together. So far, so good. He can fake that. 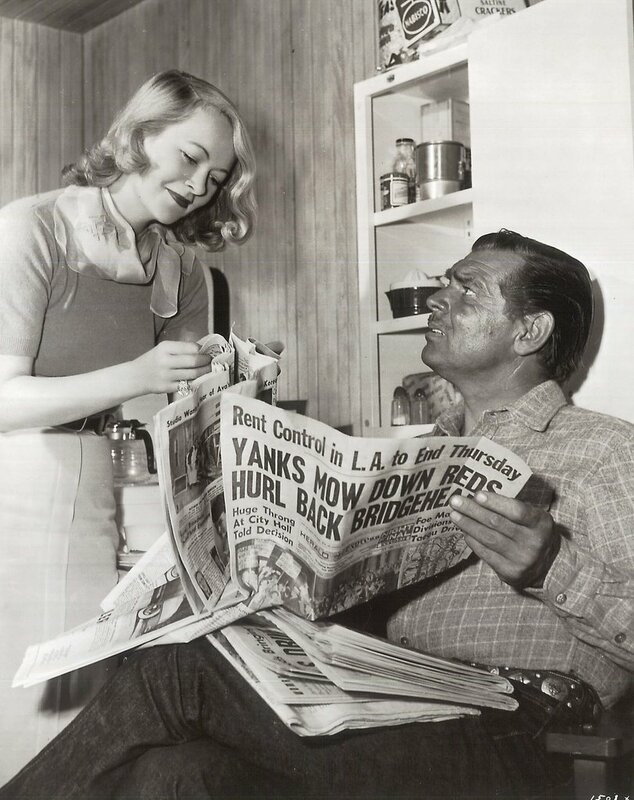 Then the publicity shutterbug gets the idea it might be fun to stage a little husband/wife disagreement over the newspaper --- so he’s instructed Clark to "act" annoyed over Sylvia’s interference with his reading. Here’s the original back caption --- "WOMEN’S PAGE … OR SPORT’S PAGE? The Gables, like all married couples, should really have two newspapers" --- or two residences, he’s thinking, preferably separate ones. Just look at that snarl! If this is acting, we’ve been underestimating this guy for too long. Judging by his deep tan, it looks as though they’ve been cooped up on location for several long weeks by now, and that’s just enough for Clark to have had a snootfull of Sylvia. 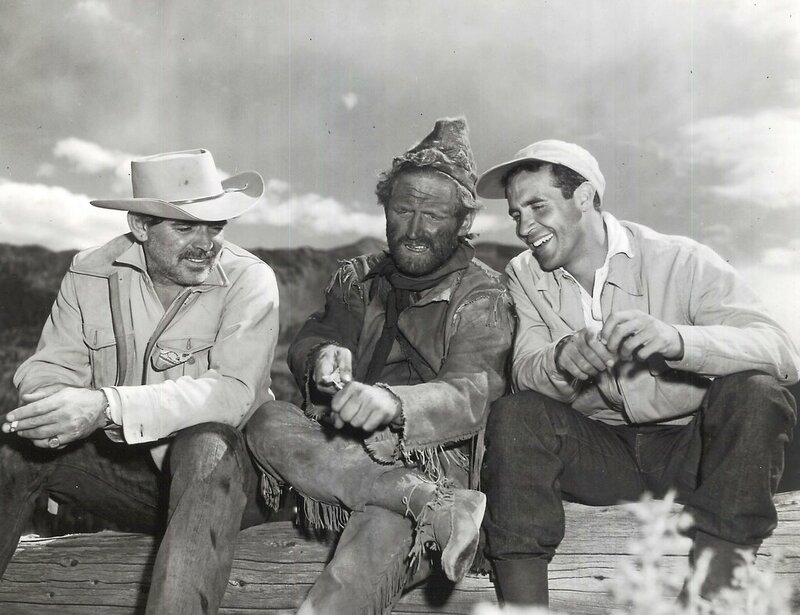 Better to pass the time with actor buds James Whitmore and Ricardo Montalban (isn’t this the movie where Ricardo got that back injury that almost scuttled his career?). In Sylvia’s defense, I will say she doesn’t look much happier than her husband in this outdoor shot. That’s a pretty nice afghan she’s working on, but I wish she wouldn’t let it lay on the ground like that. Whitmore or Montalban are liable to walk by and step on it. Oh, and for the record, the Gables split within a few months after this trip. Erm... I'm puzzled by her skirt/shoes/socks(!) combo. 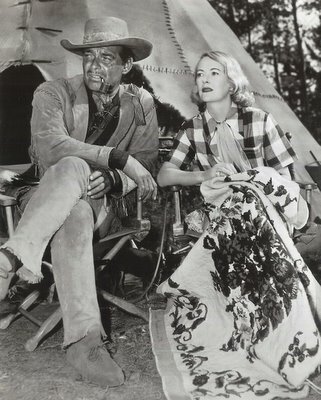 I've never cared too much for Gable, he was very much overrated IMO. Maybe Carole Lombard was looking down upon all this with a giggle. Poor Clark Gable. I feel sorry for him, losing his true love so tragically. Thing is, he made a dumb mistake. He kept marrying women who reminded him of Carole Lombard...but he should've looked for someone with a similar personality/temperament, 'cause that's much more important than a physical resemblance! Personally I think he and Ava Gardner should've gotten together. According to her autobiography they were great friends, but never got involved because he was only attracted to blondes... How silly. But Ava (like Carole) was down to earth, unpretentious, very funny (really, read her autobiography - I love her sense of humour), and not averse to swearing like a sailor. Seems like she and Clark had lots more in common than Clark and Lady whatshername.